No matter if your budget is £5,000 or £500, here are some top tips to make it stretch further. If you need to fly to your holiday destination, use a comparison site such as Skyscanner or Travel Supermarket (which also compares holidays). If you’re flexible, you can set up a fare alert on Tripadvisor to ensure you get the best deal. Sign up to Eurostar’s newsletter so that you never miss their travel deals and they also have a dedicated Offers section on their website. If you haven’t already, sign up to an airline’s reward programme such as British Airway’s Executive Club. Every time you fly, book a hotel, holiday or car hire you will earn Avios, which can then be used towards a flight. I signed up around eight years ago and have Bronze status (status is based on tier points). This means I can use the business class check-in, board after first and business class and I get 25% extra Avios for every booking. I’ve already used some of my miles to fly to Bologna and have 150,000 miles left. To give you an example of what that can get me, I can fly from London to Sao Paulo in Economy for an Avios price of 39,000 Avios and I just need to pay the taxes, fees and carrier charges. No matter which airline you fly with, or if you’re travelling with Eurostar, you will always save money by combining your hotel and flight/train than if you paid for them separately. However, always check the hotel’s own website first for any exclusive offers or special deals that include extras such as an evening meal in their restaurant, a free room upgrade or massage. They’re not for everyone, but package holidays can offer exceptional value for money as all your food and drink (excluding premium drinks) are included. Popular destinations that offer package deals are Mexico, Egypt, The Maldives, The Seychelles and The Caribbean and they can range from two star to five star. There is lots of advice and comparison tables on Money Saving Expert but the top advice is to NEVER buy your currency from the airport as you will get a terrible deal on the exchange rate plus you usually have to pay commission too. My top advice is to get your travel money from your local Post Office or, if you’re in London, Thomas Global Exchange (be sure to choose their Fast Track Branch Collection). I often find that one of the biggest expenses can simply be getting to and from the airport. For example, a taxi from JFK in New York to anywhere in Manhattan costs a flat fare of $52 plus tolls (expect to pay around $57). Research in advance if there are trains, buses or even shuttle buses that can get you to your destination without putting a major dent in your holiday spending money. Be sure to ask your hotel if they offer a pick up and drop off service. If you prefer to travel by taxi, Google local taxi firms and ask for quotes so that you can book the cheapest offer. Although data roaming charges within the EU are set to end within two years, if you are abroad it would be wise to switch off your data roaming and your voicemail to avoid exorbitant charges. Check with your phone provider as to data bundles (for example, my provider offers data roaming up to 50MB for £3 per day) or whether your data allowance can be used abroad. Most places, around the world, offer free wifi so there’s not much risk of being totally disconnected. Plus, your hotel is likely to offer free wifi or a pay-per-day charge. Wherever you are travelling to, there will always be lots of interesting and fun things to do that are free or are really inexpensive. If you’re heading to New York, here are five fun things to do for free. Be sure to ask for people’s (particularly locals) top tips on Twitter using the hashtag #ttot. 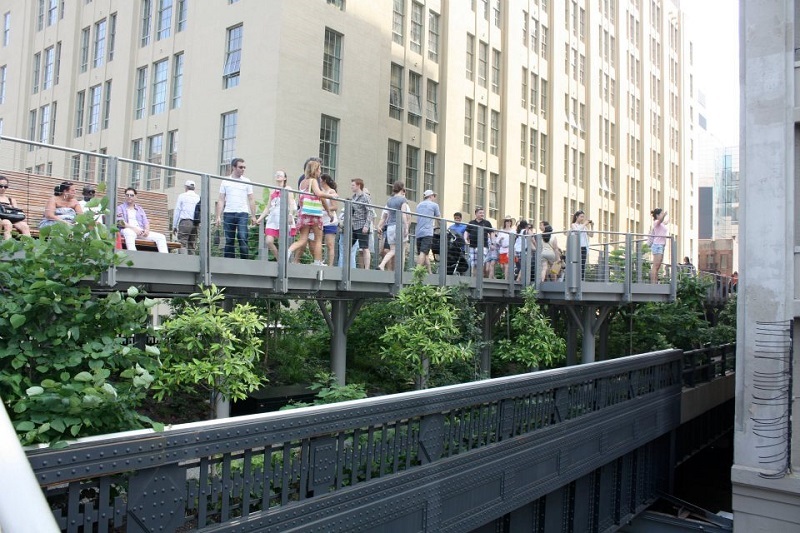 The High Line in New York is one of many free things to do. All good tips! Love your blog, looking forward to following. Thank you Sadie, that’s really kind of you to say! Thomas Global Exchange is my little secret go-to place for travel money! It truly is the best exchange rate I’ve ever received. I love the Skyscanner alerts but I have to admit I’ve never used Travel Supermarket – adding it to my faves now! Great budget friendly travel tips. Thanks for sharing.